7Display is an International Digital CPM ad network present on all major platform and DSP’s. Network provide advertising services to both advertiser and publishers all over the world. Our team is young, ambitious and highly-skilled, having from two to twelve years of experience in online marketing. 7Display are highly-skilled and experienced team. it’s goal is to provide the most convenient. safe and profitable network for their partners. 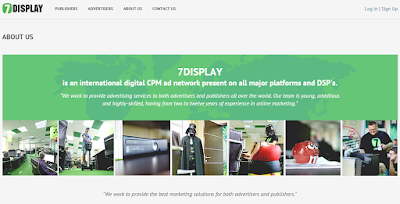 7Display network appreciate and individually approach targets of evry their advertisers To provide quality audience and inventory their quality staff constantly reviews traffic of their publishers. 7display dedicated account managers and ops team help to maximize sales and ROI of every campaign. With 7Display As Publisher you become a valuable partner of their facilities for earnings. 7display network manager work hard to provide the best monetizing solution for you. their individual approach lets us offer the best CPM rates and different revenue models for every publisher. Individual approaches for every publisher . 7display Network provide variety of ads format which include high rich media popunder, popup window and directlink. After submitting application to 7display ad network it takes up to 24 hours to make review with your application. 7Display accept almost all website their is no requirement for minimum traffic. Payment frequency with Net 45 of $10 via paypal and wire.